Sure enough, he found a number of clippings in the Laredo papers that show that Anna and Mary (along with other girls), taught school in Minera, and they stayed there during the school term with occasional visits home. 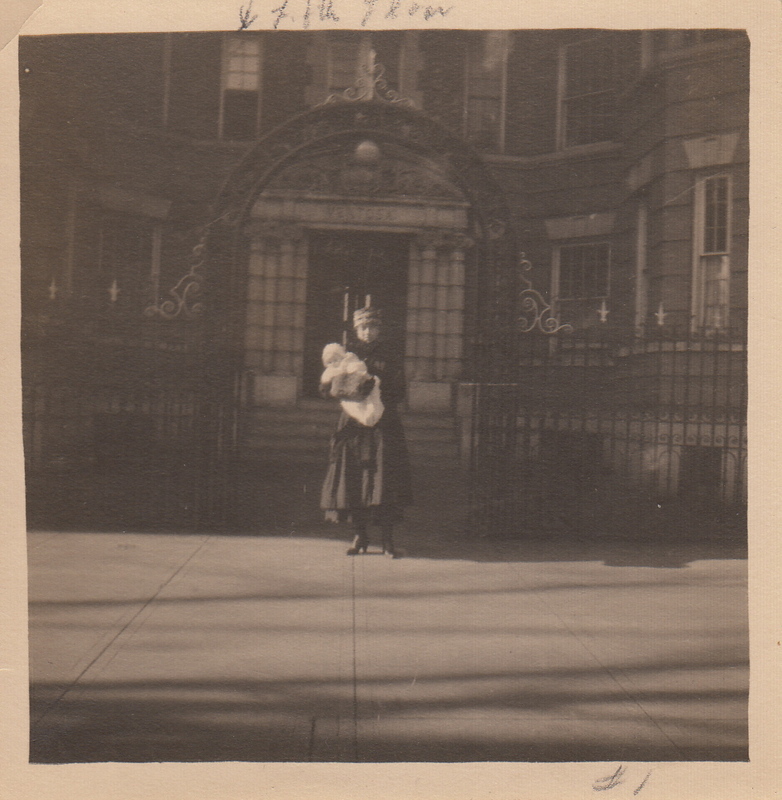 March 1908: Anna is around twenty years old. 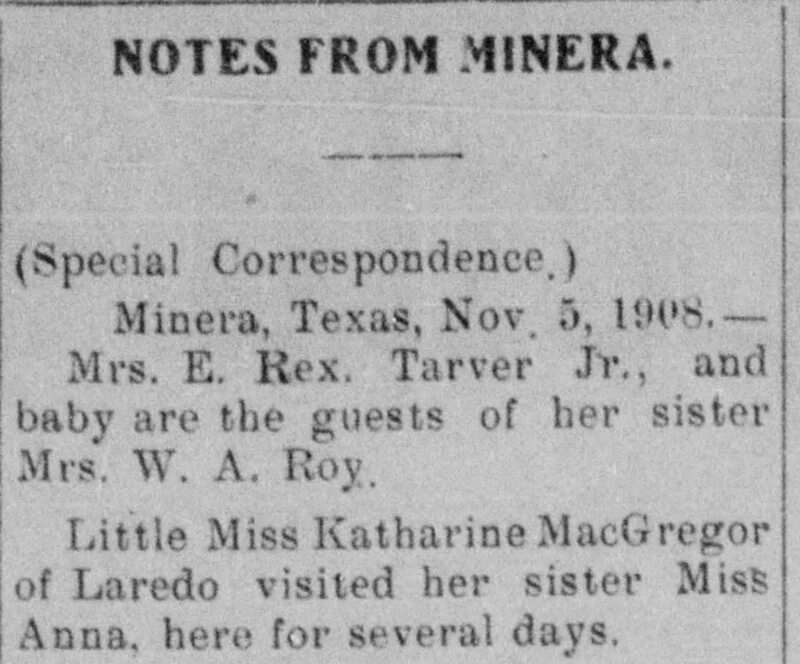 September 1908: November 1908: Little ten-year-old sister Kathryn comes up to visit! (Bonus: Mrs. Roy was the wife of the mine superintendent.) 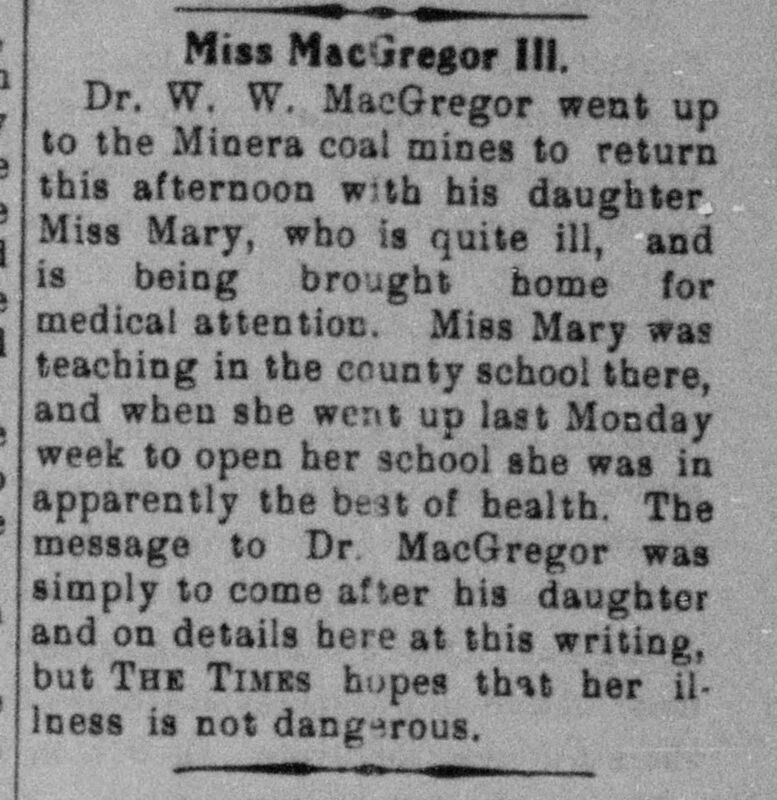 Mary had the teaching gig by September 1910, when she was around twenty. Obviously she survived the ordeal described below. (Homesickness maybe?) February 1911: Guess they had a long holiday break. 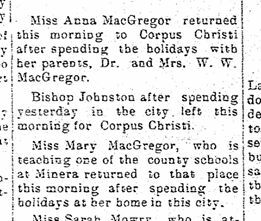 Interesting that Anna was living in Corpus Christi at this point. 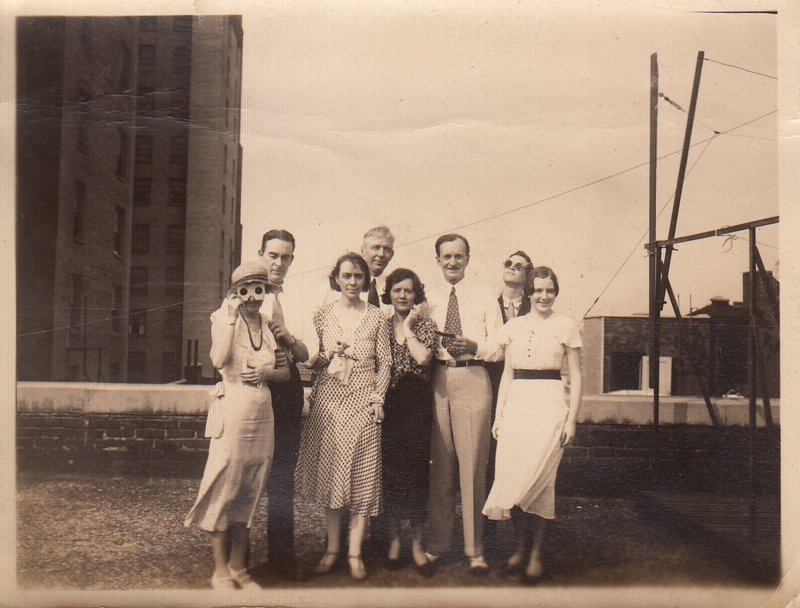 She might have been staying with the cousins and great-aunts/uncles who might have still been living up there. Was she teaching school there, too? May 1911: Mary comes home for the summer. Not yet known: how many terms they taught. And did they need the money and/or experience? 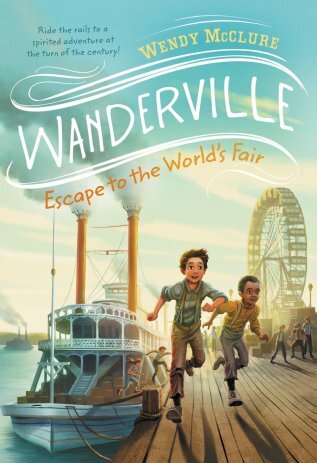 Or were they in it for the adventure? 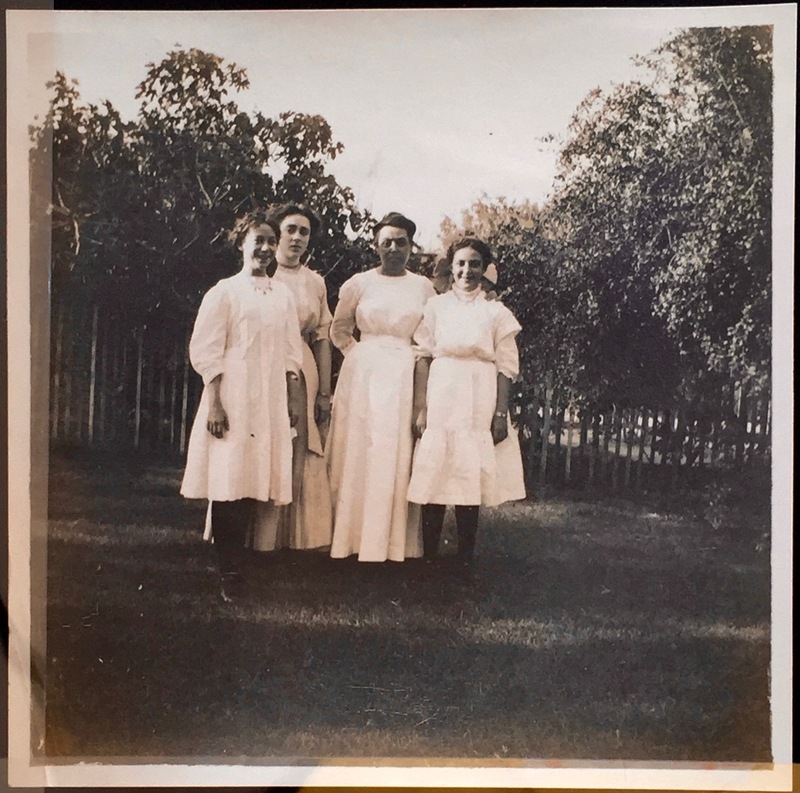 We know that Helen, who came next in age after Mary, taught in the mining town of Dolores. That might have been around the time Minera shut down in 1915. 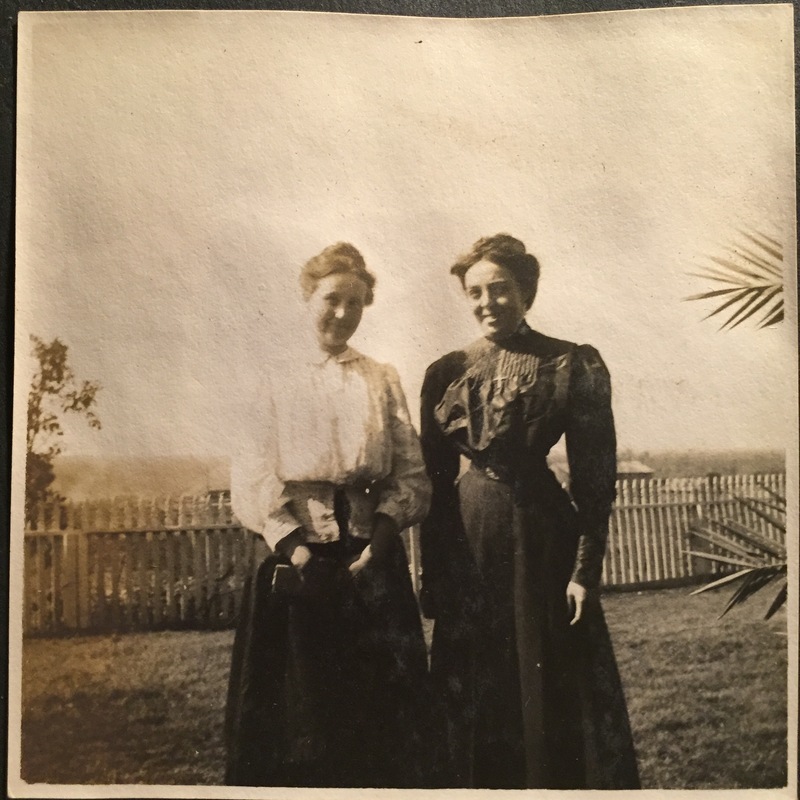 Did the two youngest MacGregor sisters—Margaret and Kathryn—teach as well when they were old enough? And if so, did they teach in places like Minera and Dolores? 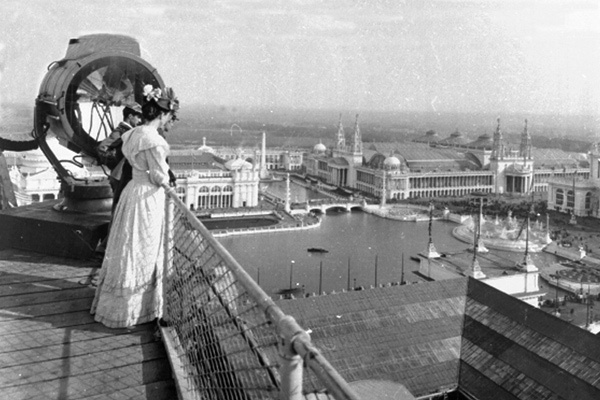 Maybe it’s because it’s summer, but I wish there were enough stuff in these scrapbooks to let me blog about the World’s Columbian Exposition for about ten more weeks, because jeezle pete, I really love old world’s fairs. 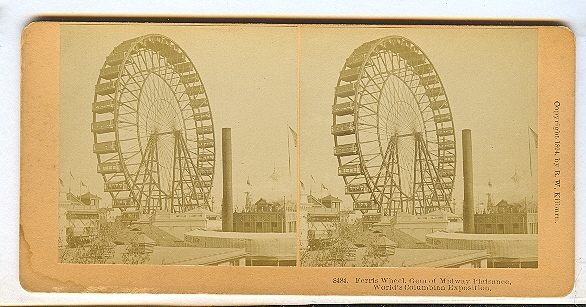 Two summers ago I was working on the first draft of a children’s novel set at the 1904 World’s Fair in St. Louis, which had the same grand Ferris wheel (the first ever, you know) from the 1893 fair. I stared at pictures of that thing so I could write the scene when the kids in my book see it for the first time. 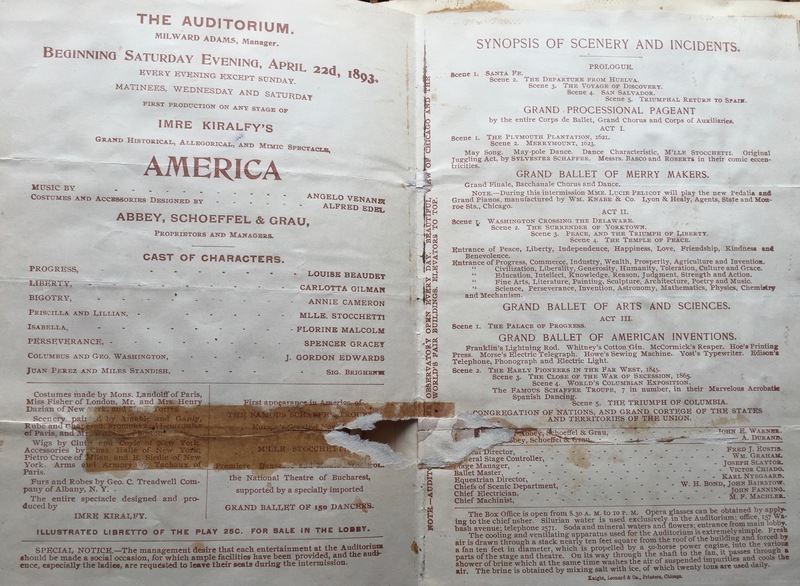 It’s even on the cover of the book (and yes, I know it wasn’t that close to the waterfront), and it turns out my great-great grandfather had been on it in Chicago. I mean, so had a lot of people, but still! 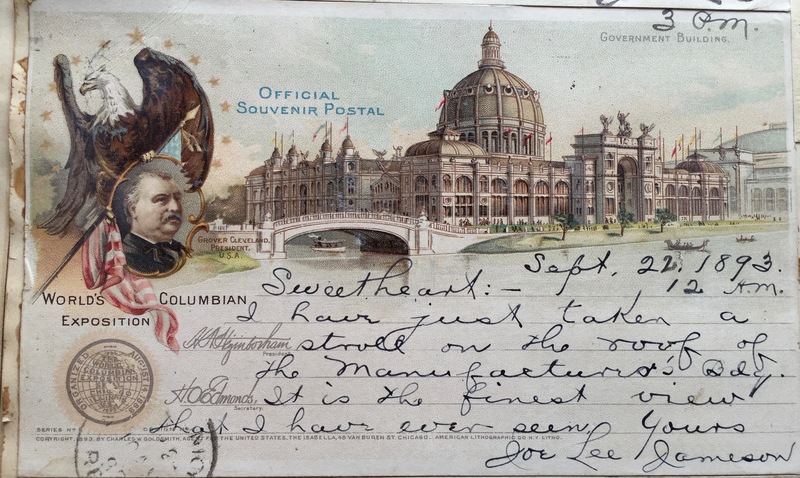 Anyway, when we last left Joe Lee Jameson, he was wandering daily around the fair and the Midway Plaisiance, sending postcards and checking his mail at the Texas building in hopes of getting a letter from his wife, Ammie. He was also most likely having a complete blast. This picture is only a couple of inches square, small enough to have been clipped out of a sheet of letterhead or a brochure. The buildings looked pretty Chicagoish to me and when you zoom in on the image you can see “Chicago” in the engraver’s signature. You can also see, on the teeny tiny banners atop the building, the words The Stamford. 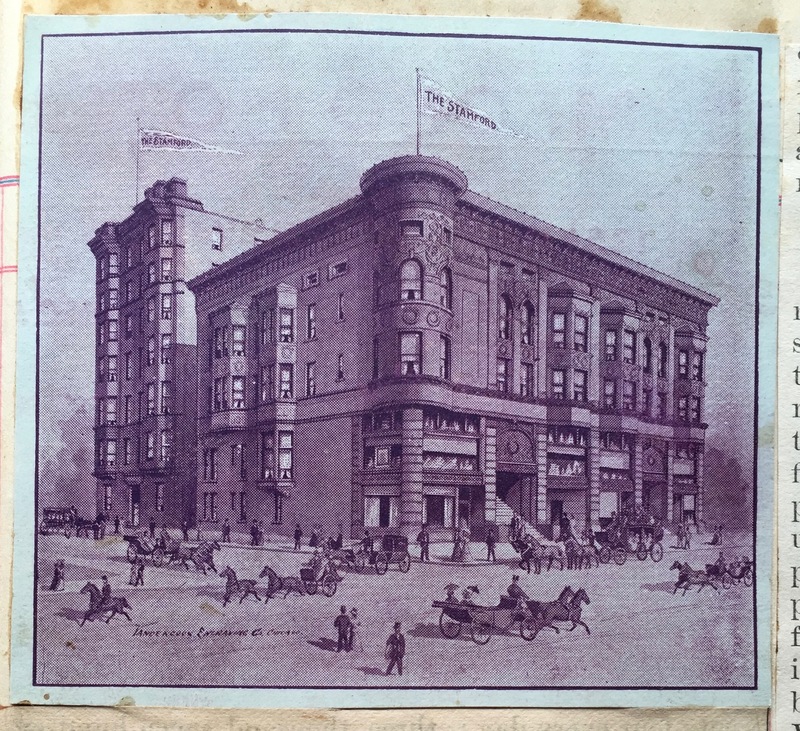 I did some searching and sure enough, the Hotel Stamford, on Michigan Avenue at Thirteenth Street, is listed in a 1893 Chicago guidebook. You can see it in this birds-eye-view here (it’s marked with a “5”). 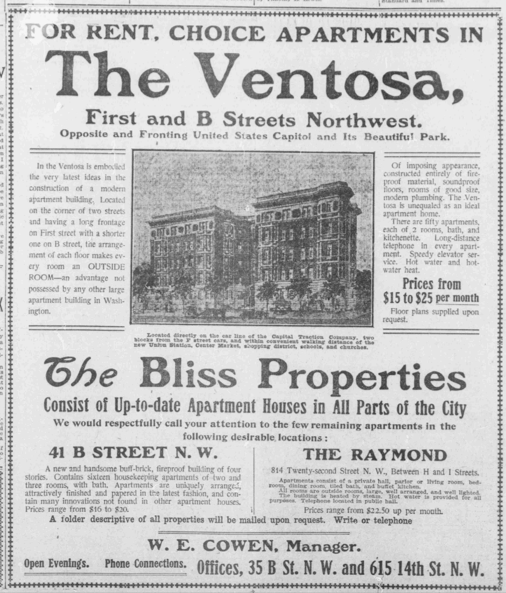 Rates were $2.50 to $5 a night, or about $60 to $130 in today’s money. For comparison’s sake, the famous Palmer House hotel had rates of $3 to $15 dollars per night, so the Stamford was probably a mid-price kind of place. 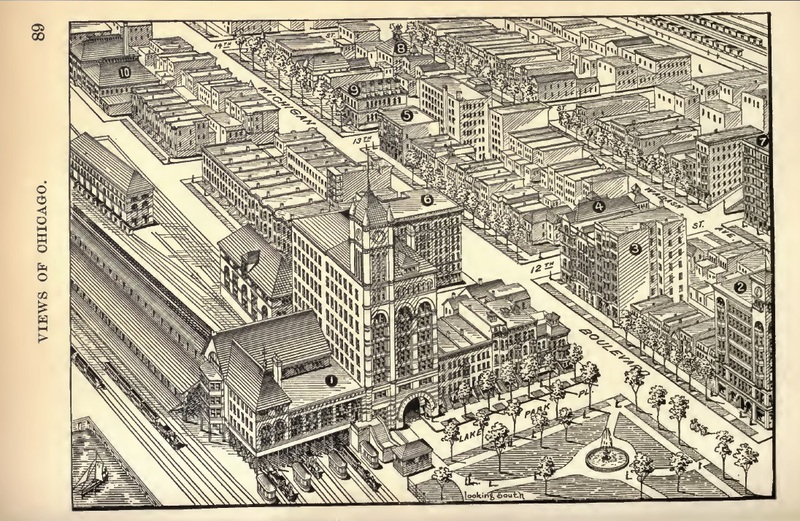 From the Stamford it would have been just a couple blocks’ walk to the elevated train (what’s now the Green Line) going south to the Exposition grounds at Jackson Park. 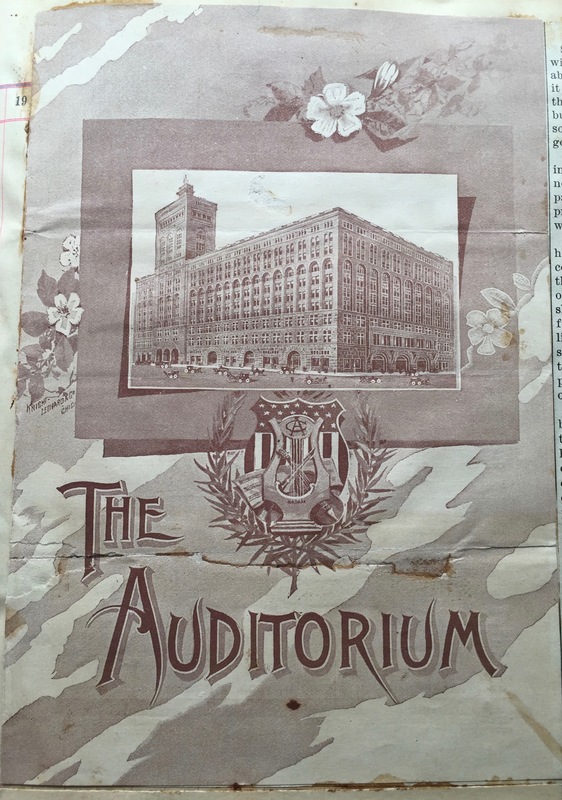 About a mile to the north of the hotel was—is!—the Auditorium theatre, where Joe Lee apparently caught a show. 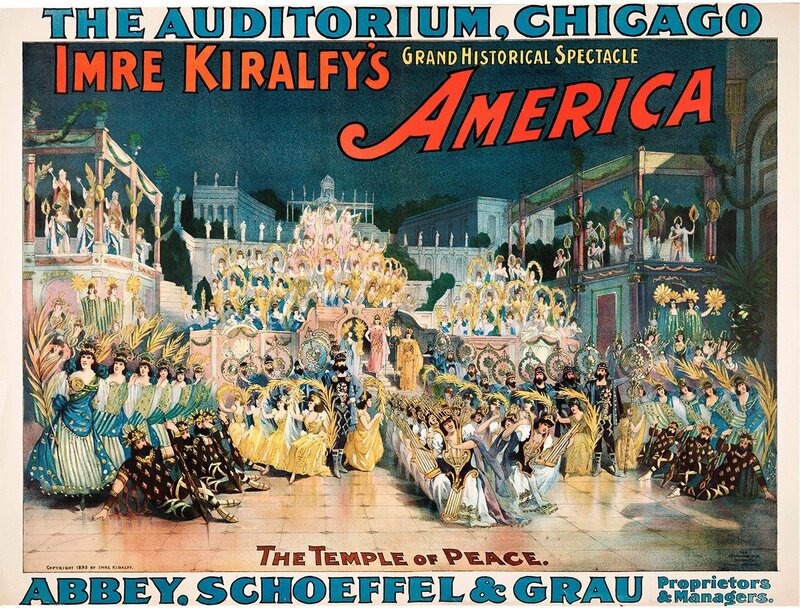 Poster of Imre Kiralfy’s AMERICA (found online), featuring a whole lot of costumed performers standing in rows & stuff. “The cooling and ventilating apparatus used for the Auditorium is extremely simple,” it begins. You can click on the pic to read the whole explanation, which involves a ten-foot-diameter fan, a shower of brine, and oh, just 40,000 pounds of ice per day. Sweetheart:—I have just taken a stroll on the roof of the Manufacturer’s Bdg. It is the finest view that I have ever seen. 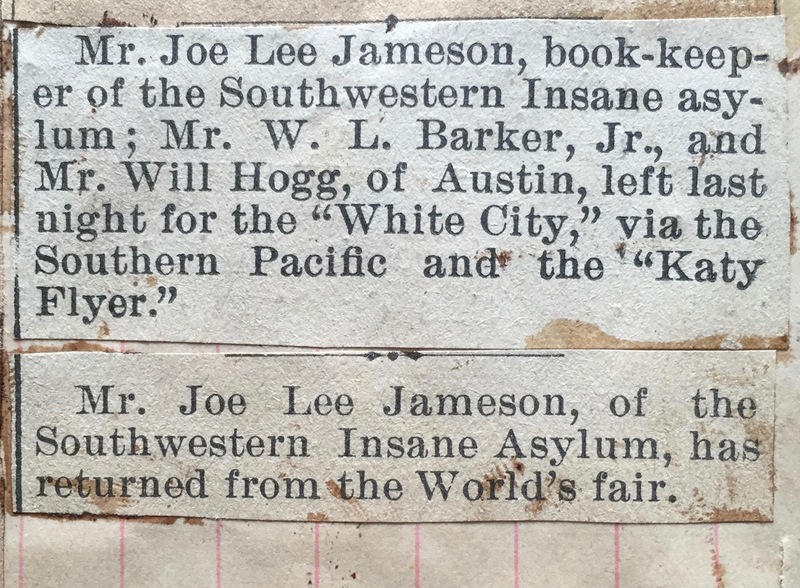 Yours, Joe Lee Jameson. Sweetheart:—Yours of the 18th is rec’d. I see the handwriting on the wall. We are all going dead broke. When that occurs, which will be very soon, we will pack our Saratogas for Texas. Why you can’t breathe at Jackson Park without first dropping a nickle in the slot. Look out for us anytime. Yours, Joe Lee. No idea if “the handwriting on the wall” referred to running out of cash or something in Ammie’s letter. Either way, Joe Lee and his traveling companions were getting sick of spending nickels. It was time to return to normal life. You know, at the insane asylum. 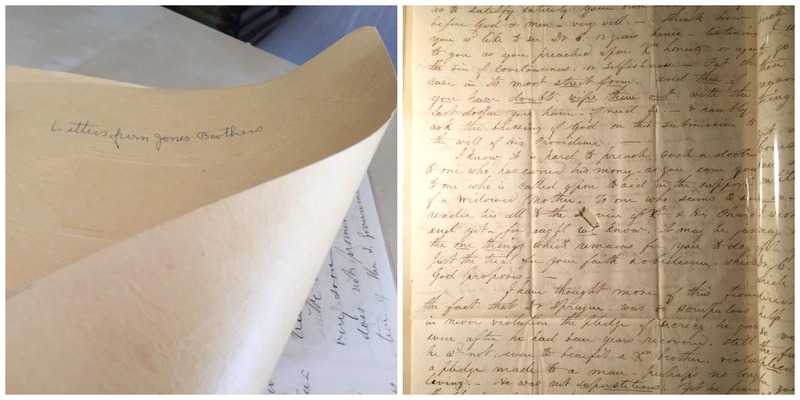 The letters are from or to Charles, Ezra, Lucius, Alonzo, and William, and the dates range from 1848 to the early 1880s. I’m slowly going through and scanning and transcribing these, and you, dear blog readers, are my excuse for getting through them in a timely fashion. 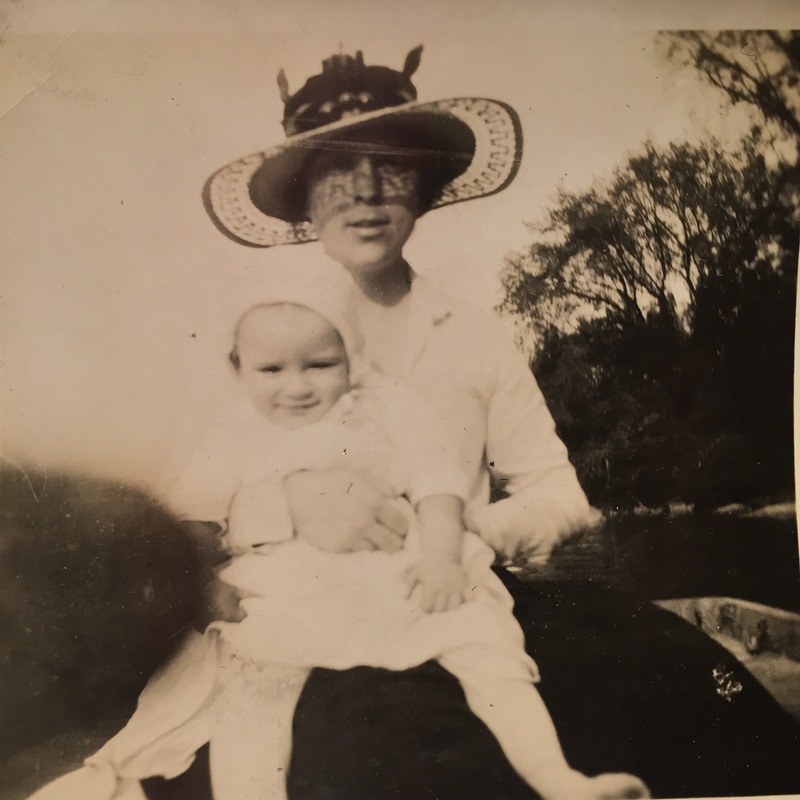 But first I’m going to cheat a little and offer up a letter that has already been transcribed, because Anna Jones MacGregor (my second great-grandmother and Judgy Anna’s mother) sent it off to be printed in a Texas newspapers sometime in the late 30s or early 40s (I’m guessing.) 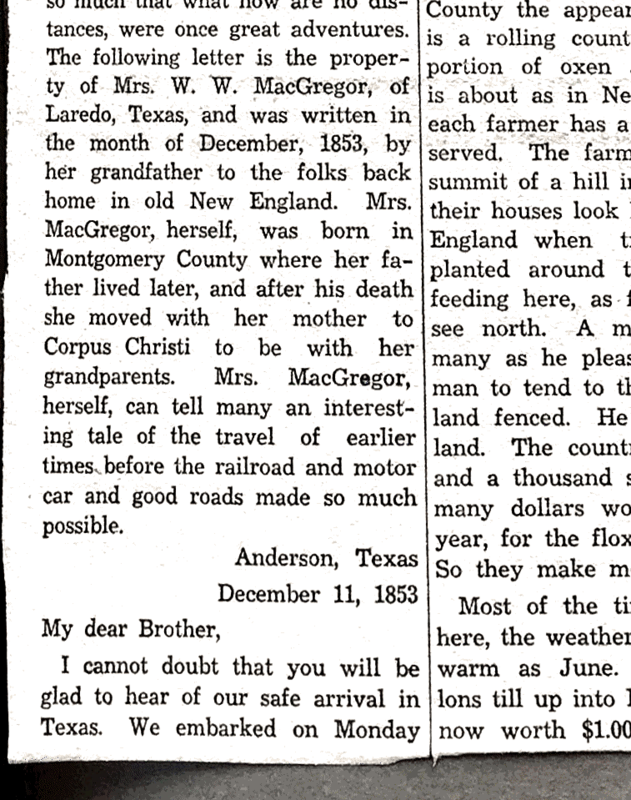 Here’s a PDF of the clipping—appears to have been from a Hebbronville newspaper, but not sure which one. I’m running it because it’s sort of a nice intro to the Jones siblings (and also I’m lazy). Intro to letter. 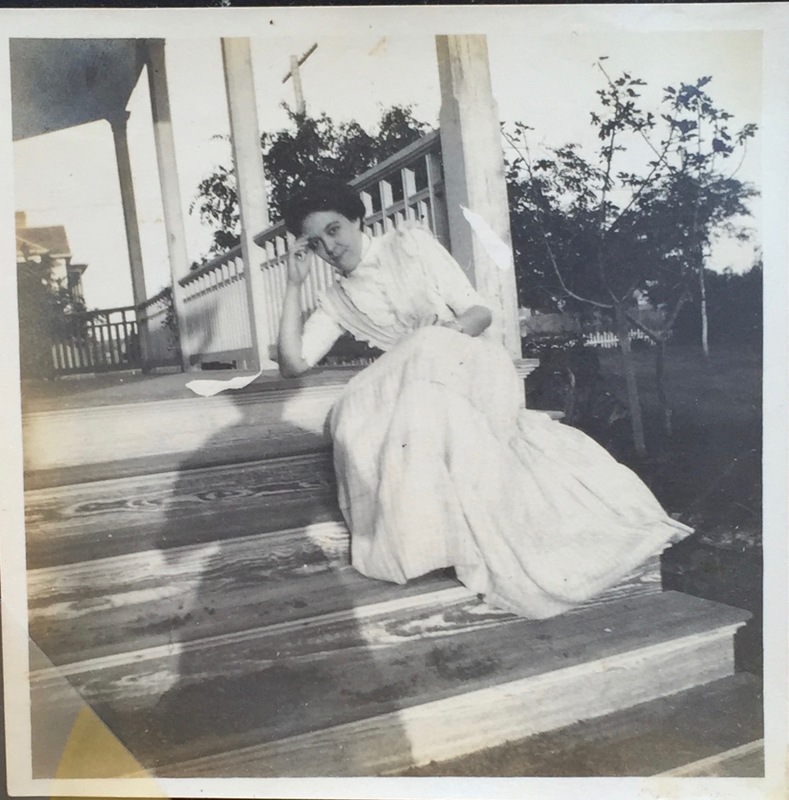 Mrs. W.W. MacGregor = Anna Jones MacGregor. 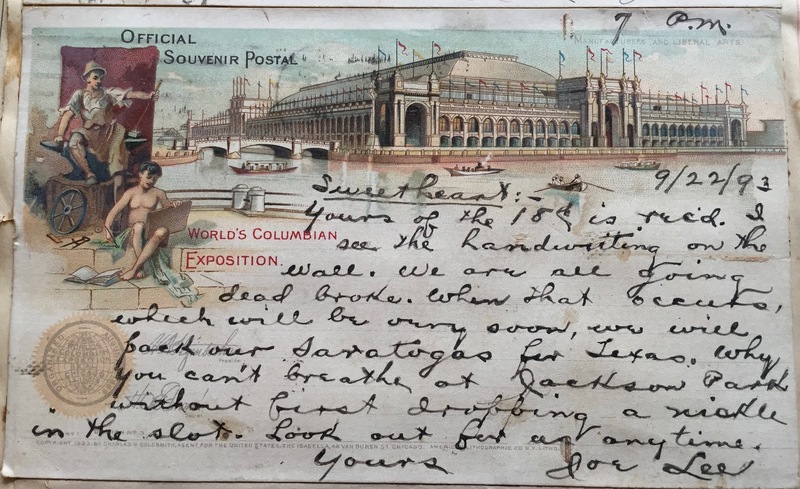 The letter is from Charles Jones, whom we met last week. 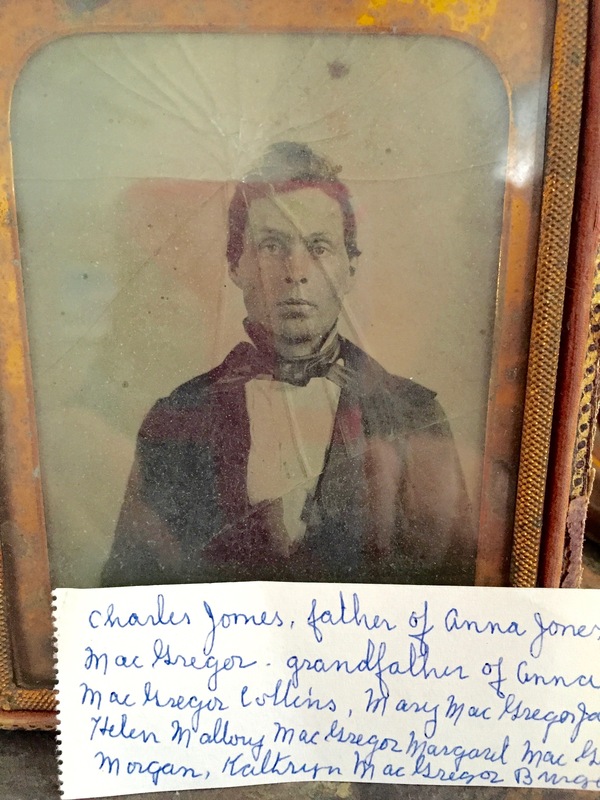 (I know, the letter intro says it’s Anna Jones MacG’s grandfather, who was also named Charles, but he died in 1843, so it’s clearly a typo). 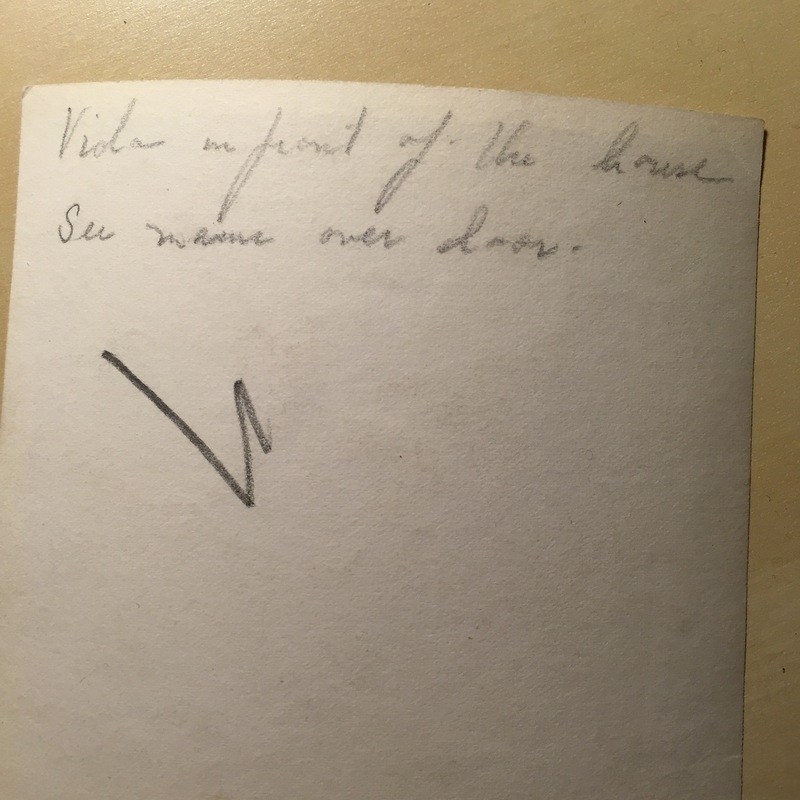 Since it was written to “the folks back home in old New England” and addressed to a brother, I’m guessing the recipient was either William or Ezra up in Boston or maybe New Hampshire. To summarize the letter: Charles, who would have recently graduated from Dartmouth (at the age of 32? 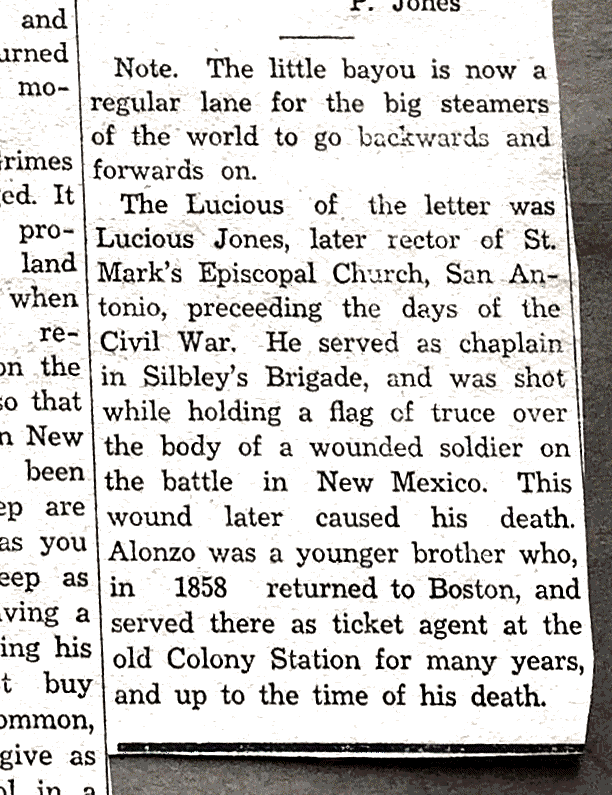 ), was traveling with his younger brother Alonzo, then a teenager, down to Texas. 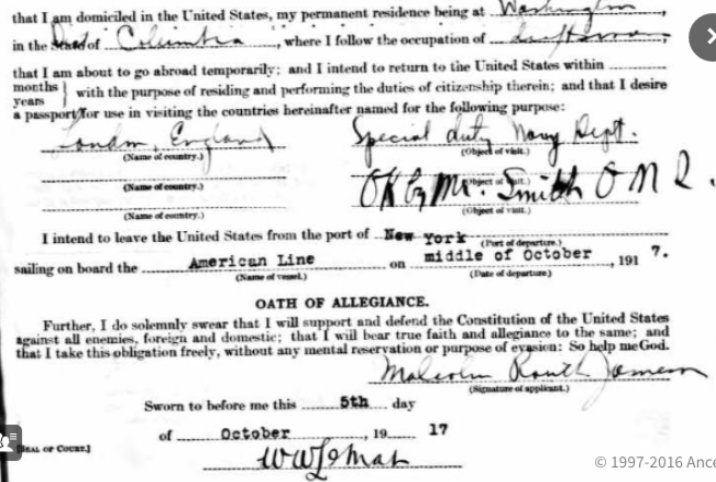 They sailed from New York to Galveston on a fifteen-day journey, took a steamboat to Houston, and then traveled some sixty miles north by wagon to Grimes County (not far from Montgomery, where he wound up living and practicing law), noting plenty of traffic along the way, probably from immigrant settlers who were streaming into Texas at the time. Was he looking to buy land? For most of the letter he’s talking about the money involved in growing cotton or raising livestock (“A man may keep as many [sheep] as he pleases,” he writes) and the rising price of land, but there’s also no indication that he was more than an observer. He and his brother appear to have known where they were headed, since he mentions they were expecting letters upon their arrival. Was Charles looking for opportunities in Texas, or was he on his way to begin a specific job? And who the heck was Sam? Some choice bits of info about Lucius Jones and Alzonzo Jones.